The Var-Spe speed variator is suitable for many types of applications and sectors, because of it’s performance features: wide speed range, high torque at low speed, strength, reliability, and resistance to strong strains and harsh environments. Techtop Australia is pleased to introduce to Australia an alternative mechanical solution to electronic variable speed. The Var-Spe Hydrostatic Transmission Series K. Fractional up to 0.25 – 4.0kW stocked at the Dandenong Head Office with 50:1 variable speed range constant torque. Wide Variable Speed range 1750-0-1750 – Independent of Direction – just turn control. Simple Direction Control – Forward or Reverse at the turn of a dial. Adjustable Output Torque Limiter – Simple torque limiting. High starting torque & at low speeds – 250% starting. Universal mounting – B3, B6, B7, V5, V6 with or without feet, flanges, etc. Ideal for Hostile Environment – ATEX Group II, dirt, dust, wash-down, explosion proof. Low maintenance – change synthetic oil every 4000 hours. Soft Start/Stop – optional soft start & stop control is available. Var-Spe K Series is a very reliable alternative to complicated variable frequency drives (VFD), with none ofthe electrical, enclosure, or engineering problems associated with VFD’s. The design is straight forward, it is an integrated industrial hydrostatic transmission. 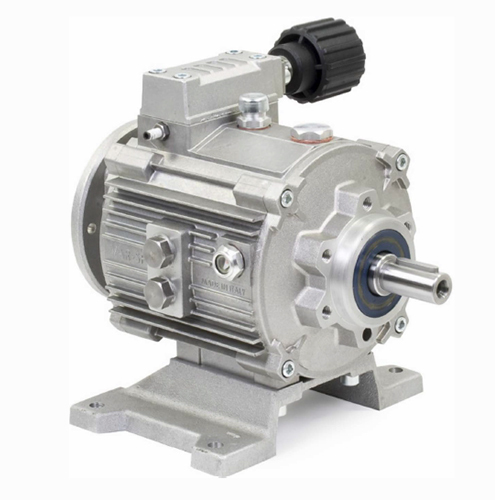 Located on the input side has a variable displacement radial piston hydraulic pump, and on the output a fixed displacement radial piston motor. Operators of machines using the K series can appreciate the ease of use, just turn the knob and speed increases or decreases to suit the application. Another great feature that process engineers will like is the torque limiting for excellent control. It can be a complete process control system.